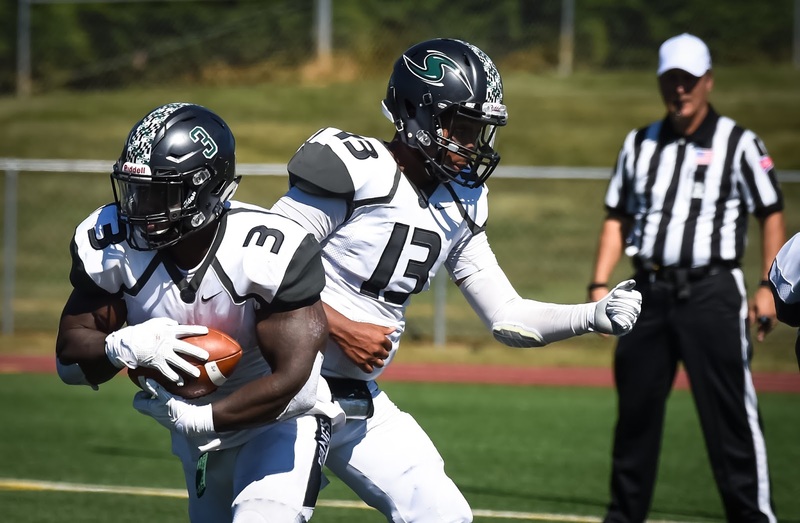 DANBURY, Conn. – Two Stevenson University football players were honored as the ECAC released its weekly football awards on Wednesday. Junior quarterback Dan Williams was named the ECAC South Offensive Player of the Week, while freshman kicker Ian Gould was honored as the ECAC South Rookie of the Week. Williams threw for 396 yards and five touchdowns Saturday as the Mustangs defeated Misericordia 65-7. He bested his own program record for passing yards and was 26-37 passing with no interceptions, the fourth time in five games Williams has not thrown a pick. On the season, Williams is 122-191 (63.9%) for 1476 yards and 14 touchdowns against just two interceptions. Gould set a Stevenson record for points in a game by a kicker as he totaled 17 points in the victory. He was 8-8 on extra point attempts and 3-3 on field goal tries, connecting from 39, 26 and 33 yards. For the season, Gould has made all 22 PAT tries and is 5-6 on field goal attempts, with a long of 40 yards at FDU-Florham on September 16. Stevenson (3-2, 3-1 MAC) is idle this week and returns to action next Saturday, October 14, when it travels to Lebanon Valley College for a 1:00 Middle Atlantic Conference contest.